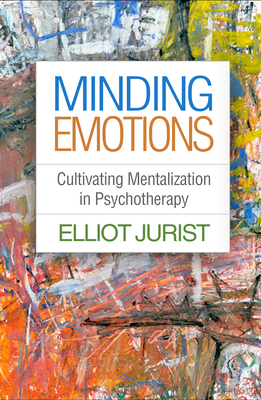 Join us at Book Culture 112th as Elliot Jurist discusses his book Minding Emotions: Cultivating Mentalization in Psychotherapy on Tuesday, October 2nd at 7pm! Christopher Christian and Norka Malberg will be joining Elliot in discussion. Mentalization--the effort to make sense of our own and others' actions, behavior, and internal states--is something we all do. And it is a capacity that all psychotherapies aim to improve: the better we are at mentalizing, the more resilient and flexible we tend to be. This concise, engaging book offers a brief overview of mentalization in psychotherapy, focusing on how to help patients understand and reflect on their emotional experiences. Elliot Jurist integrates cognitive science research and psychoanalytic theory to break down "mentalized affectivity" into discrete processes that therapists can cultivate in session. The book interweaves clinical vignettes with discussions of memoirs by comedian Sarah Silverman, poet Tracy Smith, filmmaker Ingmar Bergman, and neurologist Oliver Sacks. A reproducible assessment instrument (the Mentalized Affectivity Scale) can be downloaded and printed in a convenient 8 1/2" x 11" size. Chris Christian, PhD is the Editor of Psychoanalytic Psychology; co-editor with Patricia Gherovici of the forthcoming book, Psychoanalysis in the Barrios (Routledge); with Morris Eagle and David Wolitzky, Psychoanalytic Perspectives on Conflict (Routledge, 2017); and with Michael J. Diamond, The Second Century of Psychoanalysis: Evolving Perspectives on Therapeutic Action (Karnac, 2011). He is a Training and Supervising Analyst, and Dean of the Institute for Psychoanalytic Training and Research, and has a private practice in New York. Dr. Norka T. Malberg is a Certified Child and Adolescent Psychoanalyst. She is a member of the Western New England Psychoanalytic and the Contemporary Freudian Societies. She trained at the Anna Freud Centre in London and obtained her clinical doctorate from University College London. She is an Assistant Clinical Professor at the Yale Child Study Center as a member of the early childhood team in New Haven, CT where she is in full time Private Practice working with children and adults as a psychoanalyst and in the community as consultant to schools and other service organizations. She is an active member of Section 2 (Child and Adolescent) of Division 39 and of the Association for Child Psychoanalysis where she serves as Chair of the Social Issues Committee. She has edited and authored several books, chapters and articles, amongst them the recently published: Mentalization Based Therapy with Children which is currently being translated to Japanese, German, Spanish and Dutch. She is a guest clinical expert for the APA Clinical Video Series , most recently, she appeared in the video "Working with Emotions in Psychotherapy" representing the psychodynamic perspective alongside Les Greenberg (EFT) and Michael Tompkins (CBT). She is originally from San Juan, Puerto Rico.